Thousands of Australian students defied their country’s Prime Minister Friday when they walked out of school to protest insufficient government action on climate change. Australian Prime Minister Scott Morrison had criticized the planned School Strike 4 Climate Action protests on Monday. But the students showed Morrison exactly what they thought of his opinion, both by gathering in Australia’s capital cities and 20 regional centers en masse on Friday, as The Guardian further reported, and by responding directly in some of their signs. 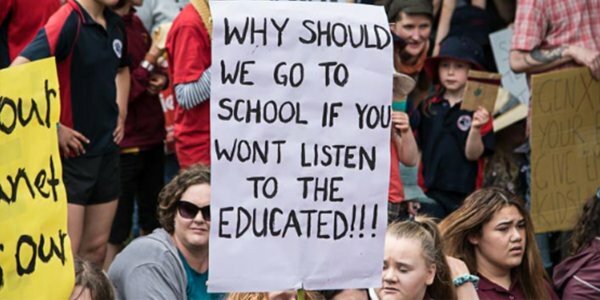 “Why should we go to school if you won’t listen to the educated?” one sign shared by Environment Victoria on Twitter read. Organizers told The Sydney Morning Herald that Morrison’s words actually brought more students out into the streets. The Australian government, however, has said it will continue to exploit its coal reserves even after the most recent Intergovernmental Panel on Climate Change (IPCC) report called on world leaders to phase out coal by 2050 in order to keep warming to only 1.5 degrees Celsius above pre-industrial levels. Morrison has said Australia will meet its pledge under the Paris agreement to lower greenhouse gas emissions to 28 percent of 2005 levels by 2030, but the most recent IPCC report found global emissions must actually fall to 45 percent of 2010 levels by that date. The most recent UN Emissions Gap Report found that Australia had made no improvements to its climate policy since last year, BBC News reported. The Australian students were inspired by Swedish student Greta Thunberg, a 15-year-old activist who launched a similar protest movement in her country. Thunberg, in turn, took to Twitter to wish the Australian students well. The Australian movement was spearheaded by two 14-year-olds in the state of Victoria, Milou Albrect and Harriet O’Shea Carre.
? Netflix Buy Rights To Merge Dorothy Of Oz With Alice In Wonderland What Makes A Good Life? Lessons From The Longest Study On Happiness ?